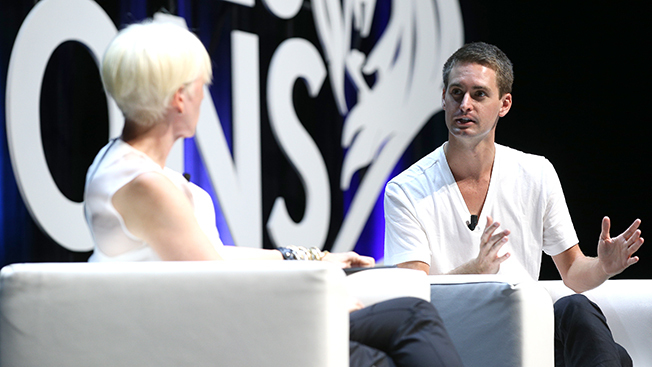 CANNES, France—Snapchat is not afraid to make decisions quickly and turn on a dime when it comes to changing directions, says its CEO Evan Spiegel. Today, at the Cannes Lions International Festival of Creativity, the 25-year-old was letting the crowd into some of the ways Snapchat thinks about its products. His four-year-old app—which is a layered-but-simplistic mixture of photo-sharing, messaging, crowdsourcing and professional storytelling—has taken the marketing world by storm, and so Spiegel is at Cannes to talk with advertising's creative class and generate business. "I love when advertising fits the context of the story we're telling," Spiegel said. He spoke on the festival's main stage, at the Palais, with Cosmo editor in chief Joanna Coles, who also happens to be Snapchat's close content partner for the Discover section of the app, the part where media companies post daily roundups of their most millennial-focused articles and videos. Spiegel and Coles talked about all things Snapchat, from its founding—surprise, it was in a dorm room at Stanford—to what the app offers brands and media in terms of reaching its overwhelmingly young audience. "We release one or two percent of the products that we're working on," he said. "We build stuff all the time that we're never going to release." Some of it's just terrible, he admitted. The rest is what the users and brands actually get to play with. Like Stories and Discover, both based on ephemerality and immediacy, connecting people with content from friends, strangers and media partners like Cosmo. Snapchat started like so many tech companies before it—particularly Facebook—on a college campus and with a dispute between parties about who came up with the app concept. The building block of the app is the notion that photos should disappear after being sent, not leave an eternal digital footprint. Spiegel and his co-founder Bobby Murphy settled a lawsuit with a former fraternity brother over the origin of the concept. On Monday, Spiegel looked back on those college days and walked through the founding of the company, minus any reference to the court case. Spiegel described his frame of mind when he and Murphy started working on the company. His fraternity had been kicked off campus, he was sent packing to a dorm, and even his girlfriend had just dumped him. "I really had nothing going on," he said. His first company, Future Freshman, was a fast failure. He said he spent a year working on that startup meant to help kids apply to college. "No one used it except my mom," he said while laughing. But it was true. After such an ignominious start, Spiegel concocted the core of what now represents a big shift in social media, the idea of chatting with photos. Snapchat is approaching a $20 billion valuation, putting it in the conversation with companies like Twitter and Facebook. The first ad products are just being developed with the ability to sponsor videos amid all the content being shared—whether it's during the NBA Finals or a music festival. There's also a way for brands to sponsor location-based filters that consumers employ to decorate their photos when they are within a certain geographic area—in a store or restaurant, for instance. Advertisers are taking part, the latest was Procter & Gamble, which sponsored Snapchat's Father's Day story stream. McDonald's sponsored the first filter earlier this month, and there are indications Snapchat will walk away with more deals following Cannes. Some of the creatives in today's crowd were just being introduced to Snapchat for the first time. "I have a lot of material now that I can go and talk to clients about creating for Snapchat," said Carolyn Gargano of Saatchi and Saatchi Wellness. "I did not expect that, but I'm getting ideas just standing here." Part of what caught her attention is Snapchat's focus on vertical video, a surprisingly new format for mobile storytelling that has been fully embraced by Spiegel. His team's first sales deck for clients outlines the company's "3V" ad attitude, which is based on vertical, video and views. Spiegel also tried to clarify how his company plans to deliver relevant advertising without being creepily targeted in the messaging, which is a personal turn-off of his. He said the company can retain the anonymity and privacy of users while still providing the tools advertisers need to be effective. How the company does that is certainly among its next challenges. Already ads have some targeting ability, based on location, for instance. "We'll make targeting available—just not bad targeting," Spiegel said.